National Day of the Cowboy was on July 23rd, and The Briscoe Western Art Museum in San Antonio, Texas, celebrated. As I’ve been watching old westerns on YouTube, I thought I’d check it out. 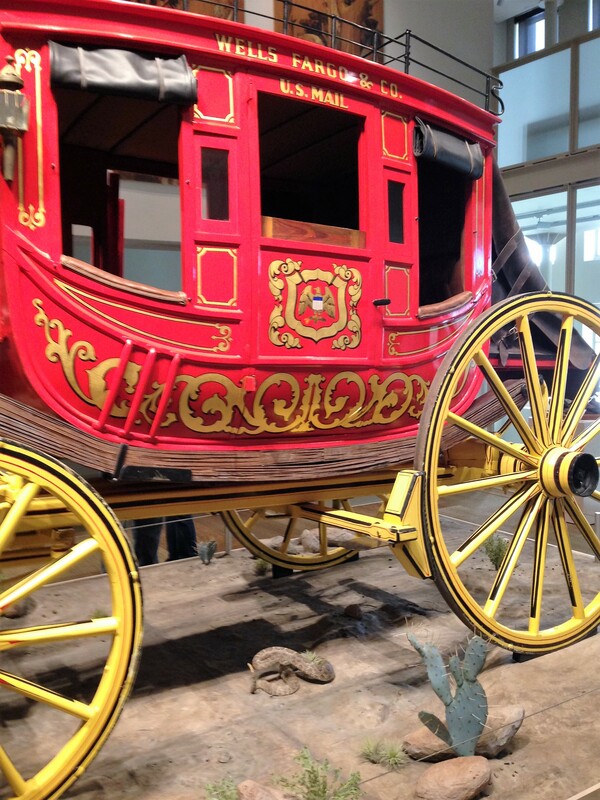 Among the many paintings, exhibits and artifacts, there was a Wells Fargo stage coach. People traveled in dust, cold and heat with the possibility of being stopped by Indians, robbers or a broken wheel. 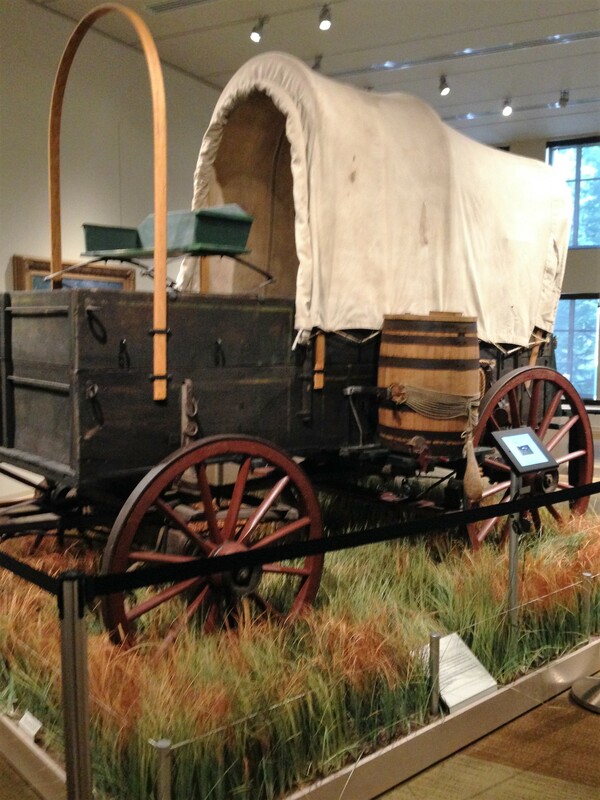 A chuck wagon on display brought images to mind about the trek of the pioneers as they traveled west in their wagons. Why did they do it? Then I heard at an audio exhibit: a reason people came west was to change their concept of themselves. Think self-concept such as being a city folk versus the imagination of going west. It was one way to leave behind how they saw themselves and their lives. And this brought me back to Soulgoals. A former masterminder and influential professional planned to launch a new career. She said that she knew her results would be defined by what’s going on in her head, so she came to me for help. In changing her concepts of self-doubt, fear of not being good enough and other mental noise, her current business soared. Now she decided her new career will be even better if she waits to start it. Because she changed the way she sees herself, she’ll be able to springboard from the phenomenal, new opportunities coming to her. What concepts do you have of yourself? For example, if you choose to get in shape, what’s that voice in your head telling you when you look in the mirror? Which do you think will help you attain your hot body faster? Beating yourself up for the %*@^#! you see in the mirror? Approving of yourself just the way you are while envisioning your ideal body and taking action? We’ve been trained to worry and be hard on ourselves with the erroneous belief that it will whip us into shape. Actually, it will either hold us back or make us unhappy. The movie Whiplash about a drummer in music school is a good example. Driven success created calamitous results. You have the ability to change how you see yourself. By doing so, you set your success ceiling. All your negative thoughts, feelings and beliefs come from your ego – a false identity everyone has. The ego is very wily and knows exactly how to trick you into believing lack, limit, anxiety and fear. You know if your ego is running your life when you’re not getting the results you choose. A businessman completed his side of a negotiation, and the transaction was to be finalized at the beginning of the work week. He gave clear instructions that everyone had to wait for papers to be signed before taking action on the new deal. That weekend, one of the parties brought in carloads of people to help in the transition, and the other party was furious. They totally blamed him. Although he was faultless, they wouldn’t listen to or believe a word he said. He played out the situation in his head over and over again about what went wrong, what he could’ve done differently. He put in weeks of work to give outstanding service, going above and beyond the call of duty. Now all that was lost, and he looked like the bad guy. While in a group session, he connected the dots and had a big aha moment. A concept emerged that the voice in his head often repeated: nobody ever listens to him. His energy had attracted a circumstance even though he wasn’t present. When he changed his self-concept, he became empowered. He recognized his worth. No longer would he play the victim. Weird how he wasn’t even around and this happened to him, right? It is until you see that you’re more than a physical body. Your energy creates. Your feelings create. The conversations in your head create. Want more success? Shift your energy. Change your concept of yourself. Your TIP is to observe one negative story you tell yourself, and rewrite it. Any negative way you talk to yourself, any depressing feelings, come from your ego. Your ego acts as if it’s being rational when it tells you negative things. There’s a perspective to make you the hero of your story. By doing so, you put your core Essence, your Soul, in the driver’s seat of your life and business. Especially for the masterminders, how high can you open yourself to receive? You don’t have to leave town or travel across the country in a wagon to change your self-concept… and enjoy the life and business of your dreams. Don’t have time or money to travel? I enjoyed a trip to Mexico minutes from my home and discovered traditions and a rich culture that I never knew existed – especially meaningful in our divisive times. 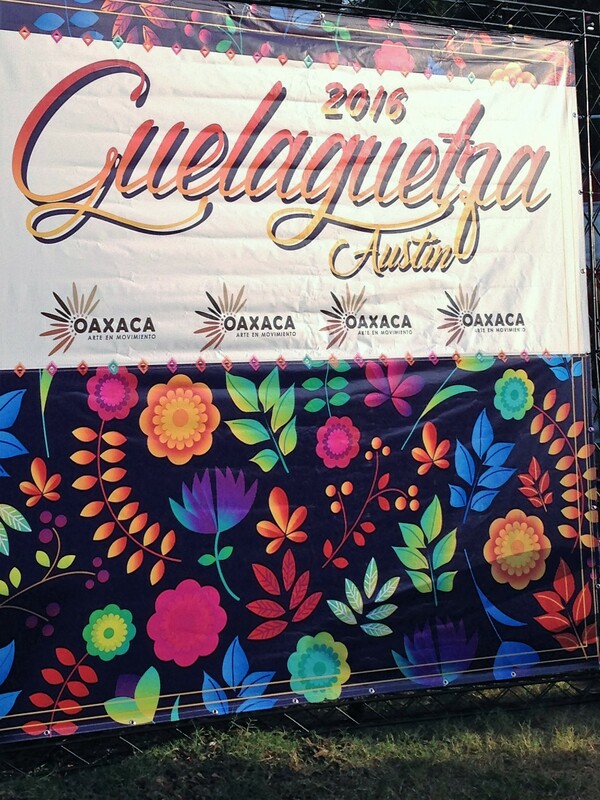 Guelaguetza is a like a big party of cultural exchange. Indigenous folkloric dances and performances honor the diversity of traditions from eight distinct regions of the Mexican state of Oaxaca. After two years of planning, this festival was proudly shared for the first time in Austin, Texas. The audience spontaneously sang beloved songs and stood while they sang the national anthems of the United States and Mexico. 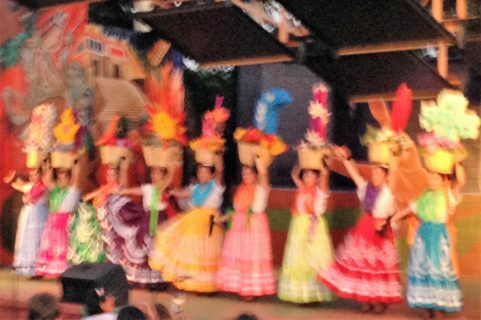 Between a couple of the performances, colorfully costumed women served mezcal, a cousin to tequila, in orange peppers that were the size of jalapeno peppers. Another first for me, just one sip went down very warm and smooth. When we finished the drink, we ate the pepper. Well over 50% of Oaxaca’s population is native indigenous, compared to 20% of Mexico as a whole. Another way of seeing this, more than half of the people come from distinctly different cultures. This photo was taken as the women completed their dance. Each wore a different costume representing her region. Their headdresses represent food they brought to share. Apologies for the fuzzy picture. I thought it better for you to see it rather than not include it because it wasn’t perfect. “This event celebrates cooperation with each other instead of war. What a gift we’re given in our modern times to witness people who honor their differences through celebration! If other humans on our planet can co-exist, respect and honor differences, so can we. We don’t have to be afraid of people who aren’t like us. What if we had conversations that opened us to each other’s uniqueness? Think what this can mean in your business and life. Instead of feeling anxious because you don’t know somebody and don’t know what to expect because they might be different than you, enjoy the contrast. What are your chances of creating a better business or personal relationship if you approach people in the spirit of appreciating their uniqueness? Here’s an example of this giving spirit before the event began. My friends and I arrived early, and I ordered a Oaxacan specialty dish from a food trailer. Although there was no line when I ordered, it took 15 minutes to receive my food. When my friend inquired about the delay, she reacted uncharacteristically with a disapproving tone. I received my food and found a place in the shade to eat it. But where were my friends? I watched an ever growing line of people waiting for food. When my friend saw that the guy was working by himself because he wasn’t expecting a crowd, she felt she needed to help him. He didn’t look at the long line of people standing in the direct sun of over 100 degree heat; he wanted to cook. But he couldn’t do it all by himself. 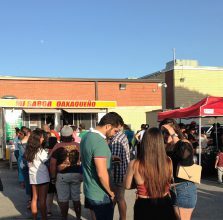 It was taking 15 minutes per person to receive food as people waited in the hot sun. She didn’t ask if he wanted help as she went into the little trailer. She told the overwhelmed, young man that she’d take orders, and he could focus on cooking. For the next two hours, she worked in the “sauna” taking orders and managing the kitchen as family members came to help. Her older brother stood by the side door. Instead of going to watch the performances, he cheerily said he was standing there to be entertained. Actually, he was watching out for his sister and smoothing the emotions of the customers who questioned the wait time. Later, when I asked why she did it, she replied. She refused any payment and accepted some soda and water for us. We had lots of laughs about it later, and no one even hinted at a word or sentiment of complaint. Your TIP is to take inspired action by doing something you feel guided to do. Be open to allow your inner spirit to lead you… not because of duty or what you think you should do. Let’s take it another step. When you take action have a feeling of goodwill and appreciation in your heart. Imagine how powerful, productive, compassionate and loving your business and personal interactions can be. Do this often enough and you’ll feel so great that your life can be as if you’re on a perpetual vacation. Last week, on the hottest days of the year, I vacationed in the Texas Panhandle, the northernmost region of Texas. Even the wild buffalo that roam on thousands of acres stayed hidden in the shade. 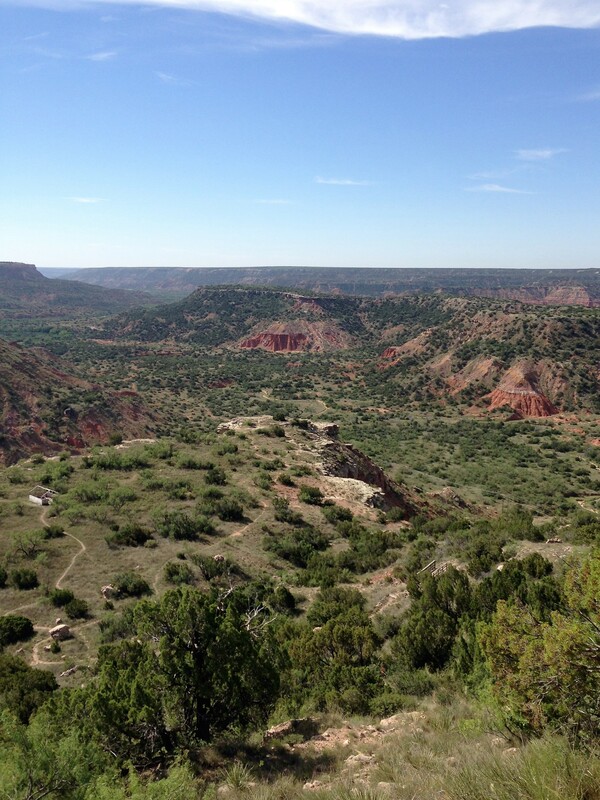 Some sites we saw were truly spectacular, such as the dramatic vistas of Cap Rock Canyon and Palo Duro Canyon, the second largest canyon in the United States, which is pictured above. There were ghost towns of previously thriving communities. Changing tides in weather and economy created their demise. The people native to the panhandle left the greatest impression on me – their friendliness, values and interests. While America reeled from the deaths of two black men and five police officers, some shared their feelings about it. A cattle rancher, whose wife is an attorney, said he’d been glued to the news. In his community, they stand behind the police, and he demonstrated his beliefs by sharing stories. His viewpoint centered on the senseless killing of policemen and felt that the movement from those who were protesting would disappear and go the way of ghost towns. On the other hand, a professional woman, while in no way condoning the killing of policemen, shared her frustration by focusing on how a pattern of police behavior triggered five officers being shot by an unstable person. Both were open to explore different perspectives. A benefit of traveling is the opportunity to witness life from a variety of viewpoints. We always have a choice to step back and see different perspectives. Sometimes our thinking is lazy, though. We become rigid, and we just want to see things the way we see them. If people are open to solutions, instead of bolstering habitual, emotional reactions like fear or anger, discussions can foster understanding and lead the way to new solutions. Likewise, when you change your perspective about yourself, you can more readily transform your life and business from stuck to abundance. It reminded me of recent conversations with people who told me that change is their highest priority. Some shared sad stories of their circumstances. But when an opportunity to change was presented, they weren’t ready. They advocated for their limitations and why they had to stay the same. Just because people ask for answers or want things to be different doesn’t mean they’re open to receive them. If they have a high tolerance to emotional suffering, pain, struggle, stress or pressure or have a strong identification with the story they tell about their lives or business, they may not be ready for solutions… although they long for it. Even if they’re positive people. Even if they act or talk positively, they often complain inside their heads. Hence, they attract more of what they think about and feel. To set the intention of receptivity, masterminders start energizing their goals by saying: I am willing to receive this or something better. During her session, she had huge break-free moments. The next business day, deals that had been stuck for months suddenly came together. Additionally, she handled a crisis at work with grace and ease and got fast results. Previously, it would’ve put her in a tailspin. Her energy shifted and the gate to her success opened wide. Crazy busy and working harder aren’t the keys that unlock your doors to success. All in divine right timing. When we’re truly ready to receive, miracles happen. Your TIP is to align your energy FIRST before taking action. Society teaches that action brings results. Your energy creates failure or success. First, align your energy for success, then take action. If you think you don’t have time for this because you’re too busy, observe your results. Feeling happy or frustrated, discouraged, stressed or disappointed? Start your shift by giving yourself permission to be kind to yourself and to feel good. Focus on what you love instead of your problems. Good feeling mojo creates success. Take a vacation from the way you usually see things. Be open and willing to receive what you choose or something better! 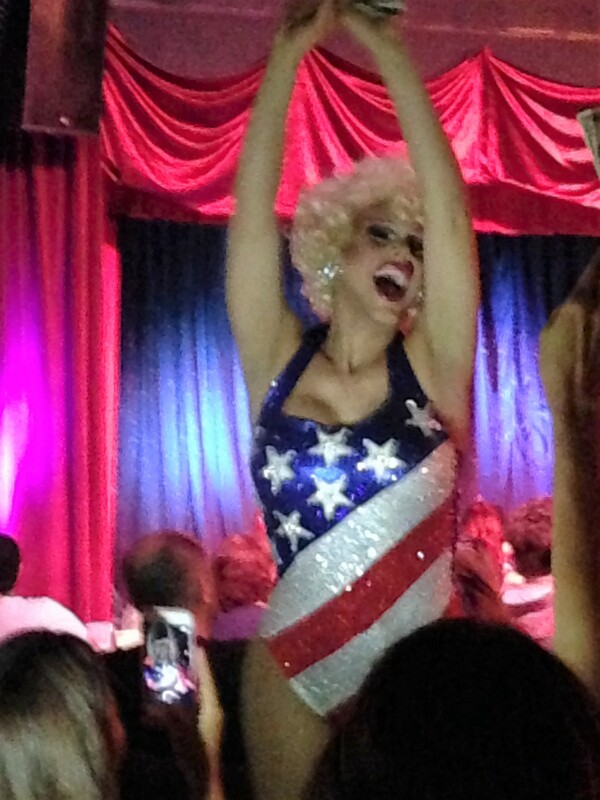 I didn’t know what to expect at my first drag show. What I found were three women who love entertaining and what they do while letting the audience join in on the fun. What a weekend to be free to be yourself as the USA celebrated our national Independence Day of freedom. Freedom for what? Freedom to enjoy barbecues. Freedom to do whatever we want as long as we’re not interfering with others. Freedom of speech. Freedom to be who we are – whatever that means. Some feel you should have freedom so you can think they way they do, but that’s not true freedom. While watching the show, I thought about how these who were men at birth considered their gender identity and made a decision. They chose to align their outer lives with what they felt within. Imagine that. Living true to you. Doing what you love instead of what’s expected or feeling stuck. These women found freedom from judgments, the risk of disappointing others and what some feel they should be. They do what it takes to be in alignment with themselves in spite of the inconvenience and expense of surgery, hormone injections and more. They stopped hiding and instead revel in their difference – even capitalize on it. If they can live true to themselves and their dreams, why not you? If they can overcome society’s opinions and turn it into an art form, what’s stopping you? What’s holding you back from really expressing yourself and your gifts? Why not really show up for who you are, shine and play big? What excuse is so big that you can’t find a way? Some hold back, question themselves, play weak, and hesitate when opportunities to break free present themselves. Some come up with seemingly logical reasons (busy schedules, money, family, health, not the right time) why they can’t move forward on living their dreams. Because they buy into their stories, they think others believe their limited beliefs, too. But they’re just keeping themselves back from greater freedom. Some are afraid of living, really living life to the fullest, and don’t believe in themselves and that they can do it. Some are afraid of possible pain and discouragement – projecting the past onto the future. Others are afraid of getting hurt, rejected or exhausted from trying – what if one more thing doesn’t work? This is how the ego works – it tricks you into thinking you’re playing it safe by keeping you in status quo or worse – sliding backwards. You are much greater than this. You have everything it takes to tune into who you are, share your gifts with the world and be richly compensated doing what you love. Your TIP is to express yourself with no limit and live your destiny, not someone else’s, NOW. You can make a decision to be alive and awake in this moment – not live in past regrets or fear of the future. You can make a decision to take action now and not put off your freedom to be the greatest you that you can be. You can decide there’s no better time to do what you love rather than put it off for some better time that never comes. Or if it does, you find another excuse to put it off. You can make a stand for YOU to express the you that’s been hiding out. You can do what you love and let go of the seemingly rational excuses and procrastination that keep you stuck. You can tap into your courage with confidence and claim your freedom to express who you are and live your dreams. Happy freedom and independence to you.